is situated 3miles from Harlech and 3 miles from Llanbedr at 450 feet above sea level, it was a 66-acre smallholding when we purchased it in 1988 a few years later we purchased a further 42 acres of rough mountain land which adjoins our boundary, the whole farm is in a less favoured area. a 5 day old jersey/limousine cross was purchased soon after moving in, the children helped to bottle feed her for the next 6 months and she was a good grounding and learning curve for us all. Daisy went on to live untill she was 20 years old, she developed arthritis in her knees and had to be put to sleep, we refer to her often, about the antics she got up to. 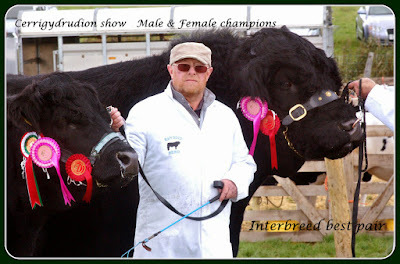 Several cows later I decided to go in for welsh blacks, and joined the society 1999. I would say the main reason is temperament, next is hardiness, there are no large sheds on Tyddyn Rhyddid to winter in, only small traditional buildings, which we use for hay, feed, and calving. The cattle like the rough land in winter as it's very sheltered and is ideal for feeding silage. We have introduced a few Dun Galloways to Tyddyn Rhyddid, their long Silver/Cream coats complements the Blacks and look lovely altogether. Calving has been very easy and they have wintered out well. When the numbers have increased we hope to start showing them with the Blacks as a native breed, hopefully in 2016.
to produce good quality stock, that are looked after to the best of our ability, and mostly, to enjoy what we are doing.